Dr Blood's Video Vault: It's October! And we all know what that means! It's October! And we all know what that means! Yes, it's that time of year again when all the fairweather horror fans and Horror Lamers start blogging furiously about the second biggest non-event "holiday" (which isn't even a holiday) other than Christmas! Yay! Prepare to be burnt out by all the tiresome posts about Freddy Krueger, Jason Voorhees, Michael Myers, and God knows how many more slashers which have nothing to do with the true supernatural meaning of Hallowe'en. Except on this blog, of course, where everything stays traditionally old school. This year, however, I have something slightly different planned for you. Whether or not I achieve it will be another matter, but I'm cutting back on the reviews and adding some more interesting stuff. No, I'm not going to write about the pathetic internet dramas caused by chubby little girls and other attention-seeking cyberbullies whose cowardly actions towards free horror bloggers are fuelled by jealousy, nor am I going to post responses to the tirade of misinformed Disqus comments I get every day from people who don't seem to understand that this is my blog not theirs. Do people honestly think that I'm going to change what I write because they don't like what I have to say? It's not going to happen. That would be as dishonest as their blogs, and be even more boring to read than my usual posts. I've been thinking of doing themed months for some time. Last month was Spanish Horror (in case you missed it), and next month will probably be all about Empire and Full Moon. That doesn't mean that I'm not going to talk about new horror movie releases anymore, but it does mean that there will sometimes be more than one post each day (or maybe none at all). Remember how I told you a little while ago that I was going to improve my game? Well, this is it. What else did you expect? I'm only a blogger. "They'll get you in the end." Charles Band recently posted this on Twitter accompanied with "By Halloween!". 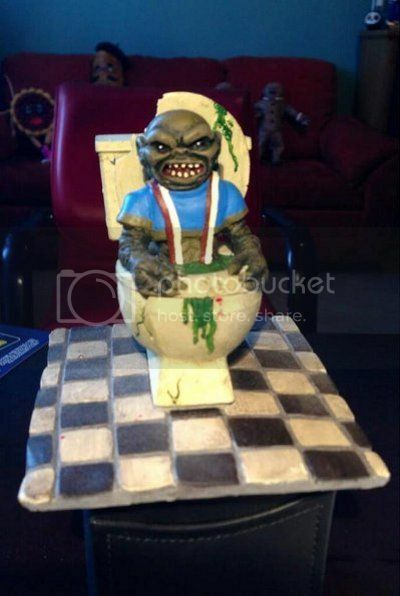 Thus, I assume that this resin "Ghoulies" figure will soon be available to buy from Full Moon Direct. Fantastic! Maybe Hallowe'en won't be such a non-event this year after all! By the way, don't forget to "like" my Facebook page. The party (such as it is) continues there!